A couple of recent reports here say the fall in house prices is declining. That's the good news. House prices are still falling, but at least they're not going down as fast as they were. In the area where I live I've seen two "SOLD" signs recently and those are the first in quite a while. That had me believing that maybe we were really near the bottom and that things might get better. HOWEVER, this past week I came across another report, this one aimed at investors in residential property. The report focuses on Dublin, Cork & Galway so it's not a full national picture, but still the headline figures are chilling. Houses are still overvalued by somewhere between 37% and 43%! That would mean that a house worth €500,000 in 2007 will eventually fall in value to around €150,000*. 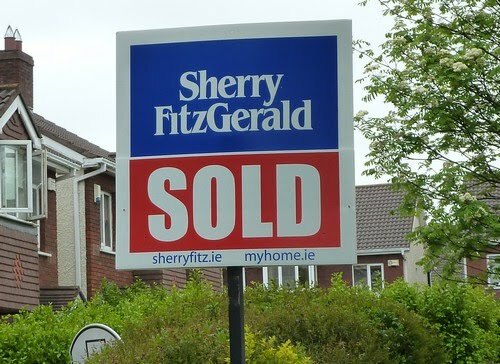 Already approximately 40% of Ireland's homeowners are in negative equity. How many more will end up there if houses are still 40% overvalued? It doesn't bear thinking about, although looking away probably won't make it go away. What does this mean for Ireland's future? It means a generation or more of Irish people are trapped. They can't move to a bigger house as their family expands and they can't move to another part of the country if there is a job there for them. Trapped. Unlike in America, Irish homeowners can't just walk away from their mortgage. Bankruptcy laws are different and the bank can (& will) pursue you for the loan even if you've handed back the keys. The only way someone can walk away from a mortgage is to walk away from Ireland, which I suspect many will eventually end up doing. At least that will make a change. In the past, official Ireland was all too relieved when the potentially discontented, underemployed young people left for opportunities abroad. This time, at least, they'll take their free college educations and leave behind a big hole in our already devastated banking system. For the first time departing emigrants will be able to stick their fingers in the eyes of those whose policies drove them away. *I'm willing to believe I'm misreading or misunderstanding these reports. If I am please let me know.